In recent times, there has been a shift towards the increased acceptance of valuing creativity for all learners. A 2003 TED talk by Sir Ken Robinson discussing this subject reached over 5 million viewers. It discusses how our current school systems suppress creativity. He proposes that our current model leaves little room for divergent thinking. 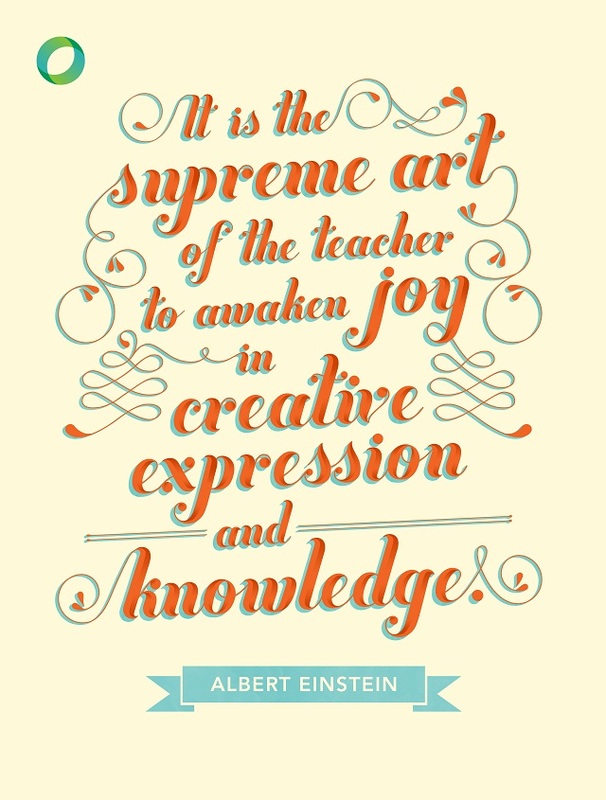 What are some ways then, as educators, that we promote creativity in our classrooms? Think of creativity as a skill. Much like resourcefulness and inventiveness it is less a trait and more a proficiency that can be taught. If we see it this way, our job as educators becomes to find ways to encourage its use and break it down into smaller skill sets. Psychologists tend to think of creativity as Big-C and Little C. Big C drives big societal ideas, like the Civil Rights movement or a new literary style. Little C is more of a working model of creativity that solves everyday problems. Both concepts can be included in our classrooms to promote creativity in general. Participate in or create a program to develop creative skills. Programs like Odyssey of the Mind and Thinkquest bring together students from around the world to promote creativity, design creative solutions, and bring them to competition. Use emotional connections. Research suggests that the best creativity instruction ties in the emotions of the learner. In the “Odyssey angels” program students can devise a solution to help their local community, such as helping homeless youth. This topic is worthy of more discussion by itself. A blog postby fellow blogger Julie DeNeen gives some valuable information about this type of teaching. Consider how classroom assignments use divergent and convergent thinking. Standardized tests do a great job of measuring convergent thinking that includes analytical thinking or logical answers with one correct response. Divergent thinking considers how a learner can use different ways to approach a problem. It requires using association and multiplicity of thought. We should design assignments that consider both types of thinking models. Creativity flourishes in a “congenial environment”. Creative thinking needs to be shared and validated by others in a socially supportive atmosphere. Researcher Csikszentmihalyi (1996) coined this term, to explain the importance of reception from others. Others consider how to create social communities that promote creativity to solve problems. Be aware during discussions. You know that student who often asks the question that goes a bit outside the lecture? Well, engage him. Once a week, intentionally address those questions. Write them down on an assigned space in the board to go back to later. Promote creativity by validating students’ creative thinking. See creativity in a positive light. In his blog in Psychology Today, Eric Jaffe talks about research that suggests see creativity in a negative light. If we are going to promote creativity, we need to embrace it too. Reward students for thinking of problems in varied ways by recognizing their efforts. Establish expressive freedom. The classroom environment must be a place where students feel safe to share novel ideas. Allow for flexibility and create norms that promote creativity. Gather outside resources. There are some great resources to read related to creativity. The University of Georgia, provides an array of amazing resources related to how to promote creativity in practical ways. It also gives a list of programs and organizations that can help with the process. Encourage curiosity.Consider what is important to students. Student interest is a great place to start on what drives their own thinking tank. Find inspiration from their world. Creativity is intrinsic in nature. Try to promote creativity by stepping into their viewpoint to find what motivates them. Observe a working model of creativity. To get a better idea of how others promote creativity, visit a creative classroom or watch a video about how a creative classroom works. The “Case for Creativity in School” is an excellent video that educators can watch to see how creativity might play out in a classroom. This school adopted a school-wide approach to recognize students. Consider the work of current experts in the field. Sir Ken Robinson is an internationally renowed creativity and innovation expert. His work is used to meet global challenges, renovating education, business, and government organizations to implement his strategies. His books and TED talks are great places to promote creativity in your own teaching. Very impressive, very important article. Congratulations on a fine piece of work. Thank you for the comment! In this article, I tried to tie together the research-based best practices and recent ideas that are emerging in the literature. The information on this topic is so extensive and complex that I was glad to hear that I did a good job. Coming from an educator who has 40 years of experience in the education field, as I saw on your website, that is really an honor. Thank you! I wanted to briefly consider how creativity came into the limelight with the dedication of E Paul Torrance who was a catalyst for gifted programs. One person asked me in regards to creativity an interesting question: Is teaching creativity a bit of an oxymoron? Well, I think that if we consider gifted programs, they actually promote creative thinking and teach students it’s okay to think outside the box. It really is an interesting field and one worthy of much discussion. The discussion on creativity will continue in future blogs. I’m delighted to read of your interest in developing creativity in schools–in and out of gifted programs. You’ve given your readers a lot to think about! This is a very comprehensive article. I love the friendly voice as you gave me the whole picture of the most forgotten set of skills in our classroom. Usable ideas for all. Thanks. Your articles helped me a lot. I am actually very interested in promoting creativity among my students; hence, I have decided to do a research on this topic. Thank you very much. I hope you will write something about the importance of literature-based instruction to enhance students’ creativity. I am a Filipino teacher who is teaching in a public secondary high school. Melvin, I will be interested to see what Miriam says about this. One thought is that your subject “literature-based instruction” is perhaps mis-named. Literature is a fabulous way to get a person thinking creatively. If you read a story, you have to imagine. A good story touches your emotions which are critical to creative thinking and decisionmaking, etc. But “instruction” tends to be antithetical to education. The instruction would be imbedded in acticities where the students talked with each other about what the literature triggered in them, to ask questions, explore other worlds, write their own stuff. Melvin-Thank you for your interest in my ideas! In my teaching program, I had a veteran teacher of 20+ years suggest creating learning opportunities imbedded in multicultural literature units. Using literature from different cultures is great because it can draw inspiration from diverse cultures and speak to children of all backgrounds. Literature, if approached as the art that it is, provides ample opportunity for students to create meaning and engage their creative side. Just this week, my daughter’s own teacher did a unit on Space exploration, which included a children’s novel about visiting the moon and was expanded into a writing and science lesson. My daughter was able to relate this to women’s involvement in Space exploration, from her personal experience visiting the NASA museum in Houston. The result was a very engaged child, who really enjoyed learning and brought home an amazing report and story about her school days. I think this is what literature does-it draws us in and makes us want to learn more. It truly explores what children like and want to learn about. I tend to agree with Rick that the term “literature instruction” can be a bit contradictory at times. As Rick said above, I believe it’s about finding “what the literature triggers in them”. We want students to find their own meanings in literature, rather than lead them to our own conclusions. I think it is all in the approach and their are great ways to use literature as a creative tool that authentically engages students to find their own meaning. I believe that is what true engaged learning is about, having students find a piece of literature that truly motivates them to delve even deeper into a subject, relate something to their own life, or explore a new world or subject area. I think that this topic is worth further exploration, so I will need to look at it closer. Thank you for reading my ideas and please continue to share! Avoid negative criticism up on your learners and especially when they give wrong trials. Teach them how to criticize constructively. The art and science of telling the truth supportively is critical. I’ll have to connect with you via twitter. Thanks for producing such a high quality blog post! Thanx for sharing this post. As a teacher, I have been trying to develop creative skills with my teachers for many years. I was thinking in publishing some of my best activities (which engage the most and provide divergent thinking), when found this great article. Congrats, sweet job! Nicely Done Miriam! To share with your readers: The home for the Osborn-Parnes model you described is the Creative Problem Solving Institute. Many of those you referenced are or have been faculty there. http://www.cpsiconference.com is the conference address. There is also an Excellent Masters in “Creativity Studies and Change Leadership” at Buffalo State University, which can be found here: http://creativity.buffalostate.edu/ About 80% of our folks come from that program, as adult learners, before becoming Associate Partners. I hope these links are helpful! This is wonderful and will help art teachers especially ”art teachers” to discover and foster creativity in students. I really like the tips of using tech, not limiting the format and incorporating unconventional learning methods to spur along the creative process. We have access to so much great tech these days that incorporating your tips should be easier than ever! Correction: Formating was lost when this was submitted, this should be a block quote in smaller font. Please correct. “Much of the blame for a lack of creativity, and therefore innovation, can be traced to our traditional educational systems. Most of the practice of creative methods is being done outside the traditional educational institutions by consulting firms and by persons in companies who have been trained in creative problem solving methods. In universities not much has changed since 1950, when the distinguished psychologist J. P. Guilford in his inaugural address as president of the American Psychological Association stated that educations neglect of the subject of creativity was appalling. Fantastic information and really shows how multi-tasked a teacher has to be. creativity in class is a very excellent thing to do as most student become very independent to initiate new things without the reminder of the educator, they are able to create projects and finished it without the educators facilitation and this make students very confident and the class become more interesting. A very useful piece of information for teachers. Thanks. Very informative and extensive. Thank you for the informative article. I don’t think it can ever be too late to congratulate you for an enlightening piece like this.I have been a science teacher educator in Nigeria for 35 years. It has greatly simplified my marrying creative thinking roles of a transformational teacher to those of critical thinking. More grease to your ‘brain and pen’. We want more. Thomas. Thanks for reading, Tais! We’ll get that link repaired right away. Thanks for letting us know. I was very interested in your article. This gave me great suggestions to use different ways of creativity in my 6th grade classroom. I liked the suggestions in making my class more active in finding ways of being better learners. in the end of your article you mentioned an article : “What Would Dr. E. Paul Torrance Do? : A Legacy for Creative Education” but you lik it incorrectly. by the way it was a great article. Thxs, so much for ds article. ……………Very informative……. “Adding Creativity to Your Decision Process.” David Hughes, 1998. I am glad to see the work of these dedicated people in this field is still being spread and used in education. Really nice ideas to promote creativity. Amazing article! I totally agree with the author at some points. Moreover, creativity is also important for your brain – it keeps it “alive” longer. The more you exercise your creativity, the stronger it gets. … “In my own life, I found that whenever I wasn’t sure what to do next, I would go and learn a lot, read a lot, talk to experts. I don’t know how … Unless you value complete silence, music can be the thing to give your mood, and your creativity, a boost. Great article! your all point mention in your article is up to the mark. Thanks for sharing such nice tips to promote promote creativity. i would like to share this post on my network. I personally love the way this blog represents information. In my viewpoint creativity is a key to all attainments in life. Thank you for stopping by, Sunny! Thank you so much for your interest of this think? I’d be deeply obliged if you could point me resources that can help me introduce creativity at the Preschool level (for 2 to 6 year olds). In particular, I’m interested in watching videos of a class in action that promotes creativity. You could email to me too. The most important point you discussed is ” To allow room for mistakes” . Thank you for sharing this article very use full information this article. Lovely Miriam Clifford Thanks for sharing this information please suggest me how to promote my graphic design skill.? Thanks you so much for this article. Its very simple ways to support creativity, we need simple ways to boost creativity within our education system.